Approaching someone new can always be a daunting task. Usually, it doesn’t matter if they’re a man or a woman, it can still be either intimidating or just plain old awkward. However, today I want to focus on women and how you can approach them without coming off as creepy and how to get the most out of your ‘moves’. I am a woman, I am writing this from a woman’s perspective and I am going to be giving you advice and tips on experiences I have had with men and how I felt they could have improved when approaching me and my friends. Remember, every person is completely different and what works for me may not work for the girl sat next to me but on a whole, I am going to try and give you advice that I know would work on me and my group of friends. I also just wanted to add if you are past the ‘approaching’ stage, make sure you check on my tips on how to make a girl horny. All of the tips are written by me (a woman) and have helped a lot of men with their endeavours. First things first don’t be creepy. It can easily be avoided, just be totally aware of what you are doing. Staring at a woman and not letting her leave your company is really creepy and might even get you into trouble. Just approach her casually, ask her how her night is and then let the conversation flow from there. Approach her how you would want someone to approach you. Don’t stare at her, walk up to her and not let her leave your company, it’s so creepy, trust me. Make sure the conversation is equal and ask questions, don’t just make it all about yourself and don’t just question her, let it flow. Be approachable! This is one of the biggest issues I find when it comes to men trying to approach women, they aren’t approachable themselves. If you’re highly intoxicated, taking drugs or even just being loud and obnoxious, you will turn most women away. The same goes for if you’re sat in a corner watching everything a group of women are doing, is highly unapproachable and creepy. Be relaxed, be casual and the best bit of advice I can give you is fake it until you make it. Bring a few mints, don’t get overly drunk and just breathe and relax. 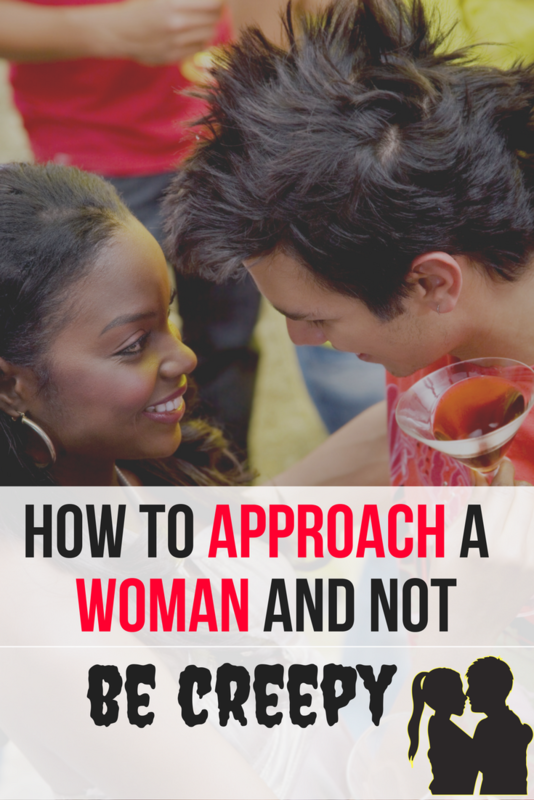 If you’re making the woman you’re approaching feel uncomfortable you won’t get very far. This tip is so important and something a lot of men just don’t understand. Don’t be needy, if the woman you are approaching is totally uninterested, let it be and move on with your life. Don’t just hang around like a bad smell, just move on. Most women know that the man feels awkward and she can sense if he wants to approach her and talk to her, we know it’s hard and we probably feel just as awkward about it all. If you’re feeling extremely embarrassed, tell her! Approach her with this line “Hey, it’s nice to meet you. My name is (your name) and I am feeling pretty anxious about even saying hello to you”. A lot of women will feel flattered that you’re a bit shy to talk to them and you being anxious is a conversation starter at least. If you’re genuinely interested in a woman and want to try and pursue something with her before you have even spoken to her or know anything about her, please do not add her on social media (unless you have met her previously and she knows you know her name). Firstly, it’s creepy that you know her name and secondly she knows it’s just so you can scroll through her photos. If you see her around a lot, approach her casually by mentioning that you see her a lot and just get talking that way. Don’t go in for the ‘do you want to go for a drink sometime’ straightaway unless you are sure she’s into you, wait until you see her a few times and lightly broach the subject with a smile and just see what she says. If you’re in a club environment, the worst thing you can do is just casually grind up on a woman. It’s really not great and unless she makes the move to do this, I really would never grind on a random woman. As clubs are loud it can be hard to talk and most likely she is with a group of friends and it can be hard to catch her alone, the best thing to do in this situation is to gently tap her on the shoulder, ever so slightly move her from her friends’ earshot and let her know you think she looks great and introduce yourself. Don’t make her come to your table, don’t make her stand with you, just see what she does and if she gets up to talk to you that’s an amazing sign and if she doesn’t and turns back to her friends, write it off as being a great learning curve and build up your confidence with talking to women. I hope some of these tips helped if you have any you would like to share feel free to leave them in the comments below.